These shinguards provide decent impact protection in a lightweight package. DISCLAIMER: I do not believe that any certain model of athletic gear will improve a person's speed, strength, or skill. If you were wearing track spikes, Usain Bolt would still outrun you in flip flops. However, wearing certain gear may make an athlete feel more confident or prepared, which may improve their mental state and make them perform better. These are just my thoughts and input on this piece of gear. This shinguard is Nike's cheaper lightweight model in the Mercurial Shinguard lineup. The Mercurial Lite Shinguard still holds certain benefits that make it a solid choice. The shell is made from a hard translucent plastic, and is fairly durable, although direct impacts from cleats will chip and scuff the paint. Even in a size Large, these shinguards are not very big and will only cover about 2/3 of the average shin. The inner part of the shinguard is a medium density foam that has criss-cross channels in it (see pictures for detail) to help with ventilation and moisture management.One interesting thing is that you can actually look through the translucent plastic and see the inner foam. 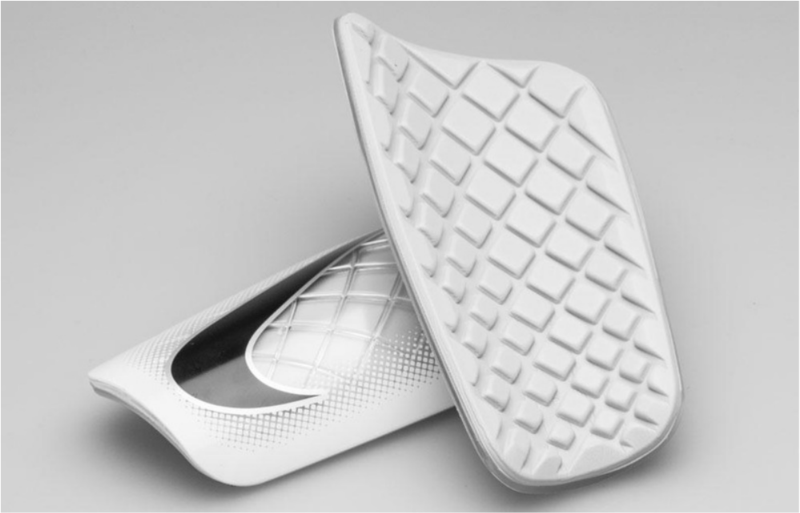 Also included with the shinguards are two guard sleeves that help secure the shinguard to your shin. They are made of a thin stretchy mesh that does the job, but probably will not hold up to vigorous use. ​I personally liked these shinguards' design and low profile. The design of the aesthetics was also pretty nice, with the detailed graphics (depending on colorway). They were a decent price, although there are probably cheaper shinguards out there that will pretty much have the same quality. They are a bit low on coverage area, covering about 2/3 of your shin, and they have no ankle protection, although I don't think that soft padding/straps will protect your ankle from a cleat tackle anyway. One thing I have to note is that they look pretty cool when they are inside the sleeve because you can see the design peeking through the mesh. Overall, these are a sleek, simple, stylish pair of shinguards. They are fairly medium sized and should do the job if you know how to stay out of trouble on the pitch. I would recommend these shinguards to someone on an average budget looking for something straightforward and lightweight to get the job done.